RC fixed wing flight instruction at Crosswinds Field starts Saturday May 28, 2016, weather permitting. EMFSO members who wish to earn MAAC Wings or improve flight skills are encouraged to participate. The program of instruction is fast paced, challenging and rewarding. Instruction is provided by experienced club instructors. For more information... contact@emfso.org . Will Wednesday nights be restricted to students and instructors only? I remember with another club, "Student Night" meant that anyone else could go flying, which resulted in crowded skies when you were trying to concentrate on rebuilding your skills. I got rattled and smacked my plane into the crash barrier and then started to pick up the bits and pieces (nothing serious but I'd snapped the nose section a bit and had minor damage. This is one evening a week, a minor sacrifice for the non-student fliers and a big part of building the students' experience and skills. Same applies to people re-entering the hobby or those (like me) who haven't flown larger models in a while. I've got a 60-sized trainer (yeah, THAT model) and really need to rebuild those skills and would prefer a focussed evening where I can get back 'into the swing of things." Thanks Bruce for the inquiry about instruction at Crosswinds. 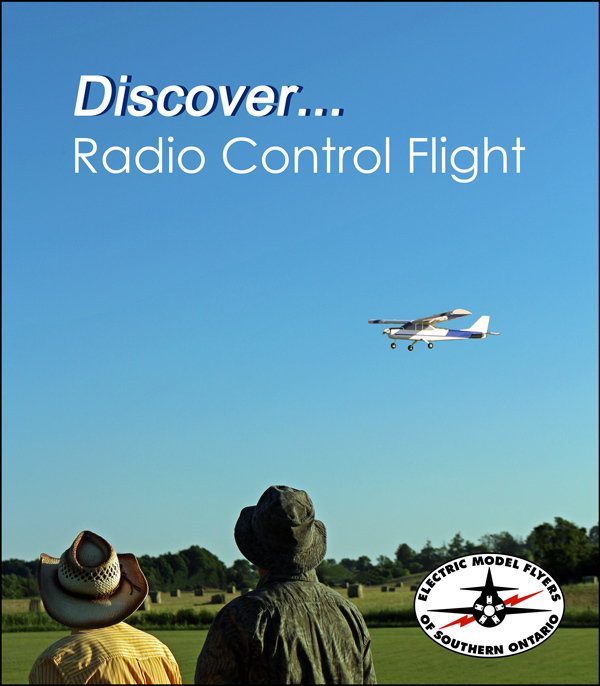 Fixed wing flight instruction is expected to start with one session per week and morph into a more individualized program on a request basis. EMFSO members respect each other... it's part of our ethos. If a student wishes to fly with no other models in the air, their request will be honoured. Most periods of instruction are short, lasting 4 to 6 minutes with one goal per flight. Students should plan for each session of instruction to include 2 or 3 flights with time for post flight discussion. The relaxed community of EMFSO members at Crosswinds Field helps everyone feel welcome. Each student pilot should also eventually plan to fly with more than one model aircraft in the air. It's part of the reality of flying radio control aircraft at events. Crosswinds Field is open to EMFSO members with a flight pass from sunrise to sunset seven days a week, year-round. Student RC pilots and members wishing to improve their essential RC flight skills will be given priority during sessions of instruction. Please note... there will be additional opportunities for instruction on weekends. Other similar planes in the air don't bother me, but someone (or multiple people) flying GLH (goes like heck) rocketships at the same time that students are trying to learn basic flight does, especially when I'm one of the students. I have a NexStar that got pranged in the safety barrier during a take-off attempt some years ago, but am nervous about it due to the size/speed combination. Same day as getting buzzed by rocketships on a previous training flight. Going to try to get it ready for Crosswinds but not feeling super-enthusiastic about it. Which will explain why I picked up a Fledgling at the Squadron905/AMAC swapmeet this morning, among some other stuff. More along the lines of a Unionville Cricket or similar trainers from when I got into the hobby back in the 1970s/80s. Just need servoes and batteries and building space and time.... Most definitely time. RC flight instruction at Crosswinds Field starts Saturday May 28, 2016 at 10:00 am weather permitting.